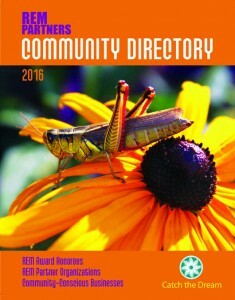 The "REM Partner Community Directory"is created yearly to promote the work of the REM Partner nonprofit organizations and honor their REM Award winners for that year. The inclusion of advertising for local businesses also provides us with an opportunity to encourage the community to shop locally. The Directory is premiered at the REM Award Ceremony on the stage of the Waterville Opera House. Everyone who attends receives a Directory as does each REM Partner organization. They are then distributed throughout the community. REM would like to do a better job of distributing this beautiful Directory. If you would be willing to help set up a system for doing that and then implement it we would be deeply grateful! If you would be interested in selling ads, doing layout or distributing the publication please click the button below.